The study of European wild food plants and herbal medicines is an old discipline that has been invigorated by a new generation of researchers pursuing ethnobotanical studies in fresh contexts. Modern botanical and medical science itself was built on studies of Medieval Europeans’ use of food plants and medicinal herbs. In spite of monumental changes introduced in the Age of Discovery and Mercantile Capitalism, some communities, often of immigrants in foreign lands, continue to hold on to old recipes and traditions, while others have adopted and enculturated exotic plants and remedies into their diets and pharmacopoeia in new and creative ways. Now in the 21st century, in the age of the European Union and Globalization, European folk botany is once again dynamically responding to changing cultural, economic, and political contexts. The authors and studies presented in this book reflect work being conducted across Europe’s many regions. They tell the story of the on-going evolution of human-plant relations in one of the most bioculturally dynamic places on the planet, and explore new approaches that link the re-evaluation of plant-based cultural heritage with the conservation and use of biocultural diversity. 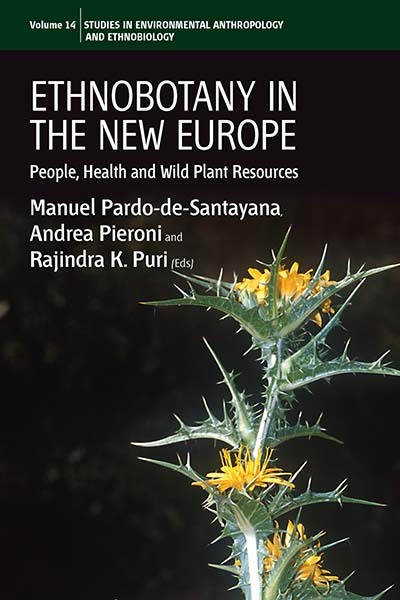 Manuel Pardo-de-Santayana is a Senior Lecturer of botany and ethnobotany at the Universidad Autónoma de Madrid. He has been researching contemporary and historical uses of Spanish medicinal and wild food plants, homegardens, and folk botanical taxonomies at the Royal Botanical Garden of Madrid (CSIC) and the School of Pharmacy (University of London) since 1995. Andrea Pieroni is an Associate Professor of plant biology and ethnobotany at the University of Gastronomic Sciences in Pollenzo, Northern Italy. He is the editor-in-chief of the Journal of Ethnobiology and Ethnomedicine and the President of the International Society of Ethnobiology. His research focuses on food and medical ethnobotany in the Mediterranean and in the Balkan areas, and among migrant communities and diasporas in Europe. Rajindra K. Puri is a Senior Lecturer in environmental anthropology and ethnobiology at the University of Kent at Canterbury, UK. While his primary research area is Indonesian Borneo, he also supervises M.Sc. and Ph.D. students who conduct ethnobotanical research in Europe. With Christian Vogl he co-organizes a summer field school in the Austrian Alps on methods in ethnobotany and works with the Global Diversity Foundation in Morocco, Malaysia and Namibia. Chapter 6. ‘My Doctor Doesn’t Understand Why I Use Them’: Herbal and Food Medicines amongst the Bangladeshi Community in West Yorkshire, U.K.
Chapter 16. A Comparative Study of Rural and Urban Allotments in Gravesham, Kent, U.K.